FORT STEWART, Ga. - Brigadier General Christopher P. Hughes said if you want to get a feel for what life is like in his hometown of Red Oak, Iowa, all you have to do is leave your car in the high school's parking lot and walk along 8th Street as twilight sets in. "You will see, feel and understand the magic in that town," Brig. Gen. Hughes said. "That's what my wife and I do; when we're done, we are reenergized and we believe that everything we do--the sacrifices we've been through in the last 29 years--are worth every second." Brigadier General Hughes, the deputy commanding general for maneuver for the Third Infantry Division, makes it no secret that he has a special connection to Red Oak--a town of less than 6,000 residents named in the 1800s for the trees that line the bank of a stream that flows through the community. 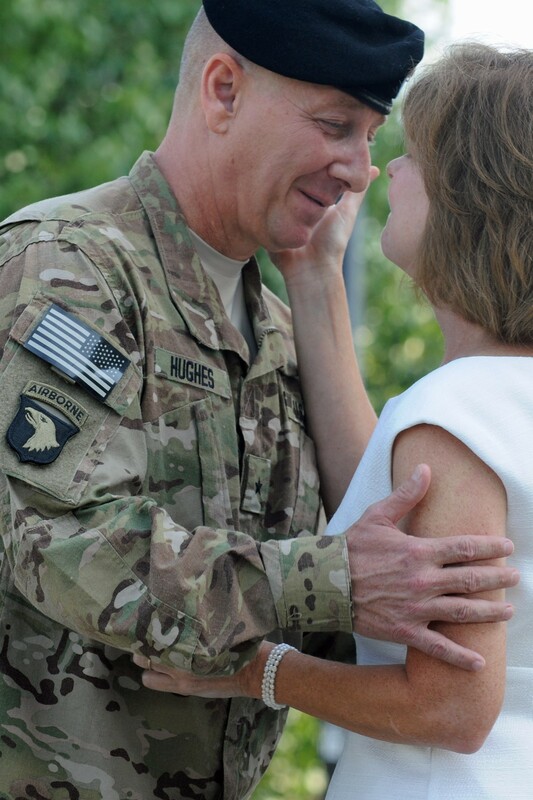 Brigadier General Hughes said he and his wife, Marguerite, visit their home away from home two to three times per year. And, he said, it's not just the town that beckons him home; it's the presence of his close friends of 30 years who still reside there. Brigadier General Hughes invited six special "Red Oakians"--as he calls them--to his promotion ceremony to brigadier general, Aug. 3, at Marne Garden on Fort Stewart, Ga. He also presented two ears of corn, symbols of Iowa and Red Oak, to his wife before presenting the traditional bouquet of flowers at the conclusion of the ceremony. Brigadier General Hughes said to understand how he's made it to the top ranks of the Army you need to look to his roots. His Red Oak roots began growing in 1972 when his father left the Air Force after 23 years of service to open a chiropractic business in the town. He said the transition from being a military brat was difficult, and that he upset a few apple carts along the way as he became accustomed to life in the tight-knit community. Being an impressionable young man at the time, the general said he was immediately struck by the patriotism exhibited by Red Oak's citizens. He said the combination of his Family's service in arms in both World Wars, Korean and Vietnam wars, and the townspeople's appreciation of military service and their love of country positively shaped him and spurred his desire for a military career. "You were to serve your country and serve others before yourself--that's how the heck you were raised in that town," Brig. Gen. Hughes said. The deputy commanding general said Red Oak also taught him to try his hand at everything and be as proficient as he could be. He laughed, and said it's not often you see jazz and pep band and chorus and theater on an infantry officer's high school resume, but that's what you did in Red Oak. There were only 116 students in the class of 1979, and he said his high school expected, if not demanded, participation of each student so that every activity was flush with competitors. "In the Army we teach people how to think and not what to think," Brig. Gen. Hughes said. "That was something I grew up in Red Oak with--the idea that you don't try to do exactly what it is the book tells you to do, [you] do what your heart and your gut tells you to do." Brigadier General Hughes said after he graduated from high school he attended Northwest Missouri State University. Because he longed for the leadership and confidence he had seen in the military men he grew up around, he said he joined the Reserve Officer Training Corps. Brigadier General Hughes added that his anticipation about the military was that there were no prejudices; that every slate was wiped clean once you joined. He said he saw through his father's career that the playing field in the military is fair and that you can get as far as you want based on your own personal intestinal fortitude to make it happen. "But I never believed for a second that I would be selected to go this far," Brig. Gen. Hughes said. "In fact, I'm probably promoted three ranks above any dream I ever had." The deputy commanding general said he will continue to serve as long as his country calls on him to do so. He said his desire to give it his all at the top levels of the Army goes back, again, to what he learned in Red Oak. "The secret is not trying to figure out how to do it, the secret is just doing your best every single day and trusting in your training and … in your friends," Brig. Gen. Hughes said. "What matters is how hard you try and how much integrity you have." 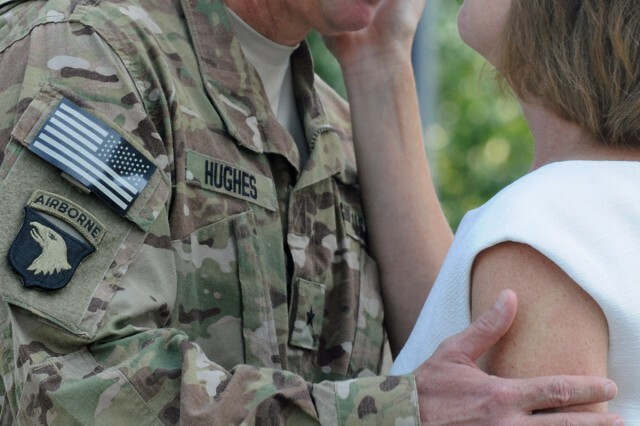 As he prepares to deploy with the headquarters of the 3rd ID to Afghanistan, Brig. Gen. Hughes said he dreams of the future retirement days he and Marguerite will spend in Red Oak. The deputy commanding general said if you travel to a specific piece of undeveloped land in Red Oak you'll see the beginning phases of the Brig. Gen. Hughes' retirement spread, a cabin that's being built. "I'm going to enjoy hunting and fishing and walking down 8th Street. I'll do any job for a dollar a day and [do] anything the community needs me to do."